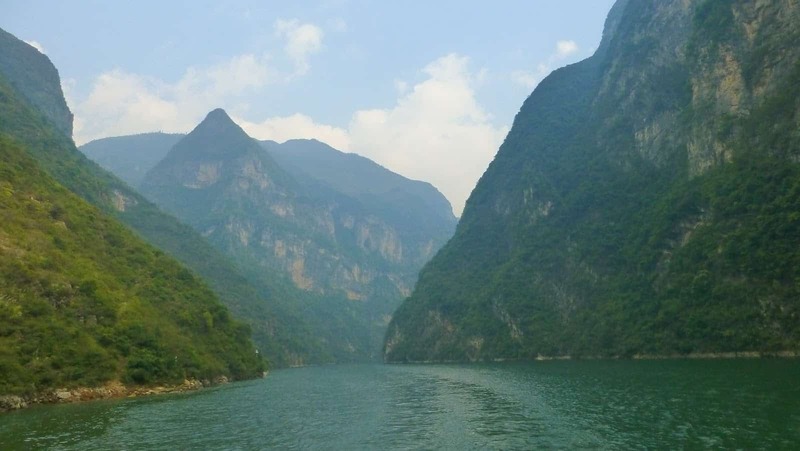 A highlight of the Yangtze River cruise (for me) was our trip along the Shennong Stream, a narrow tributary of the Yangtze River – the Lesser 3 Gorges. 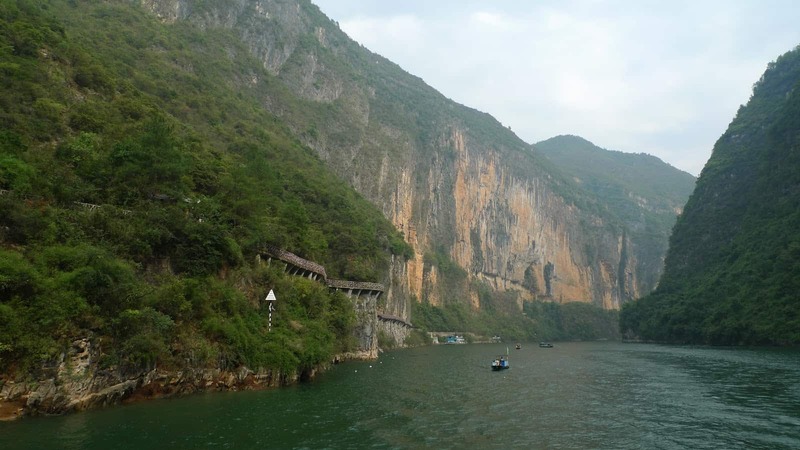 From our cruise ship we boarded a small ferry boat which took us through amazing gorges. 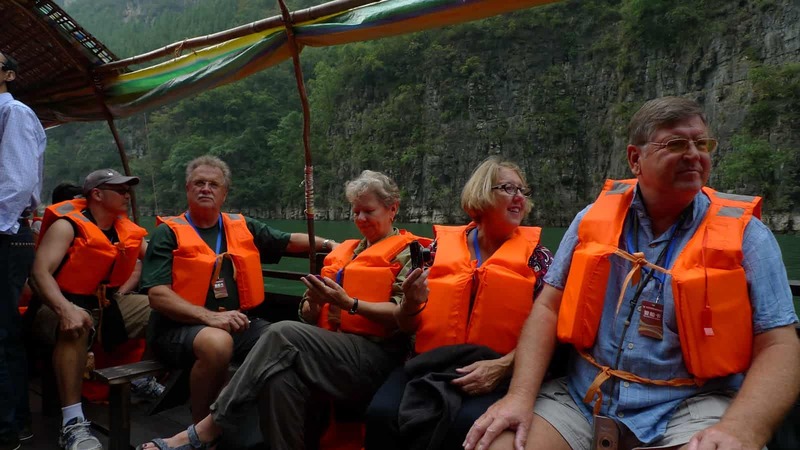 The scenery was a stark contrast to the heavy industrialised and smoggy parts of the Yangtze and we were able to get a firsthand view of the area’s pristine nature. 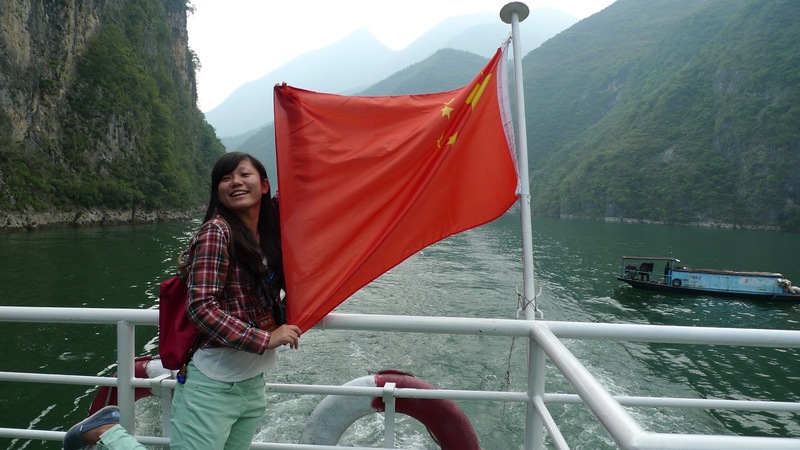 There’s something odd about playing with the Chinese flag. Like someone’s watching, not pleased. Must have been ok, Jing didn’t seem to mind. There’s Jing, Jimmy, Kay and me. 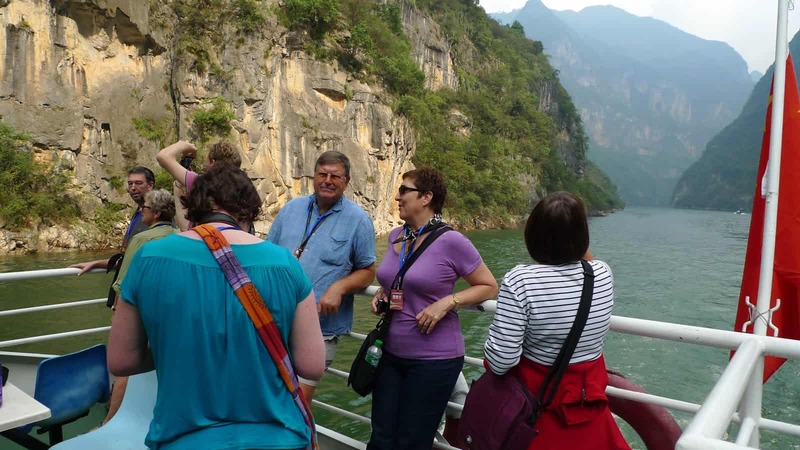 We were all awed by the stunning scenery. Jing and I in deep conversation. Kay & Margaret chatting while Sam takes it all in. 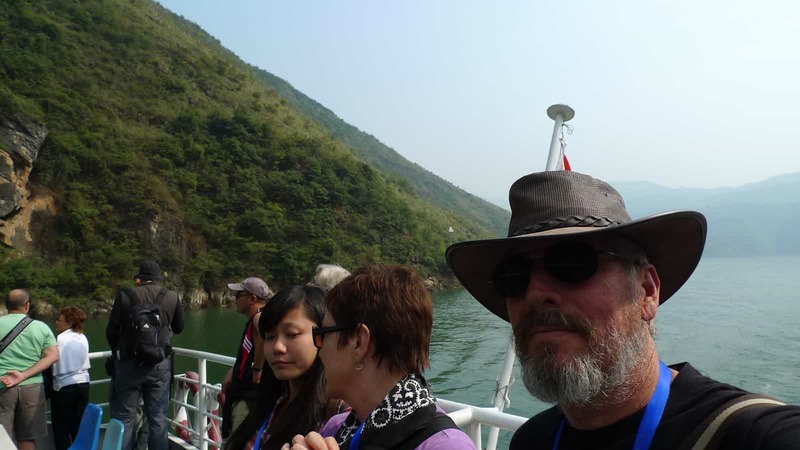 We traveled upstream on the ferry boat for around 45 minutes before transferring to sampans at the Shennong landing. Just watching the changing landscape and colours was amazing. Stan & I must have been talking about something terribly interesting. 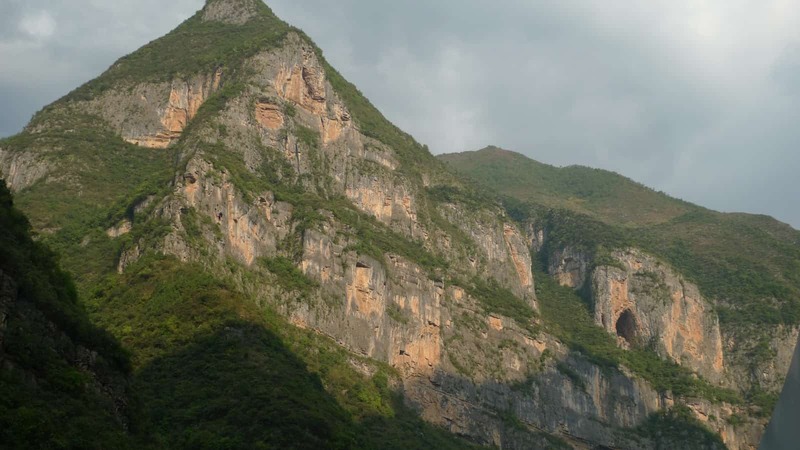 There is a lot to look at: steep ridges and peaks, huge caves, thick vegetation, wild flowers, plank roads built along cliffs and the ancient hanging coffins which date back about 2,000 years. 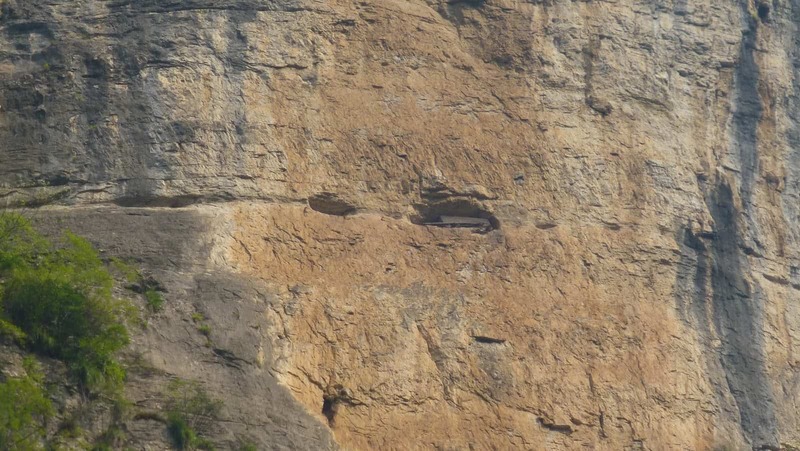 Ancient local inhabitants buried their dead in hanging coffins in little recesses in the sides of the cliffs. How they got the coffins to these remote areas baffles everyone. 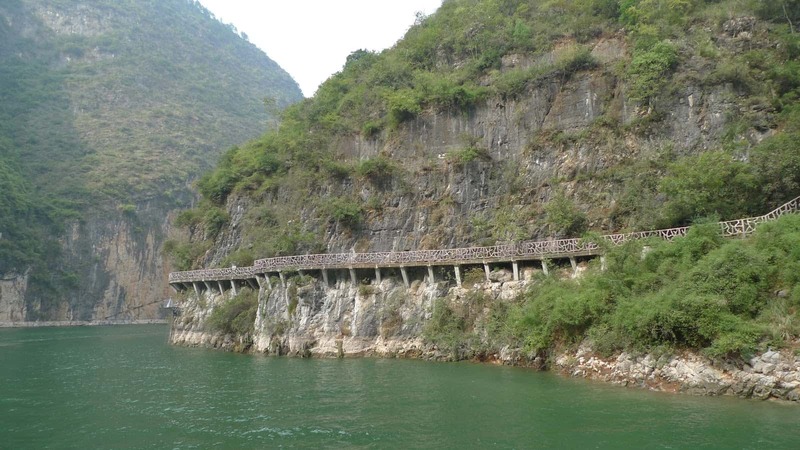 Due to their high elevation, many of the coffins haven’t been able to be seen, but since the construction the 3 Gorges Dam, you can now get a better view than before, because the water level of the stream is now higher. 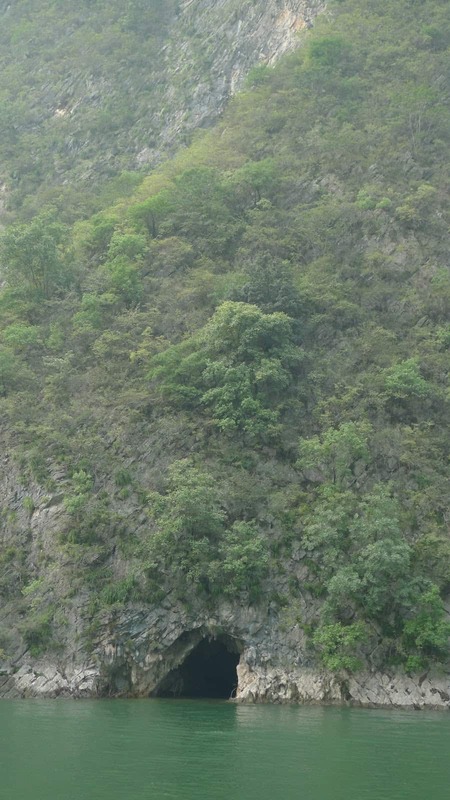 If you look closely you’ll see a coffin near the top right. 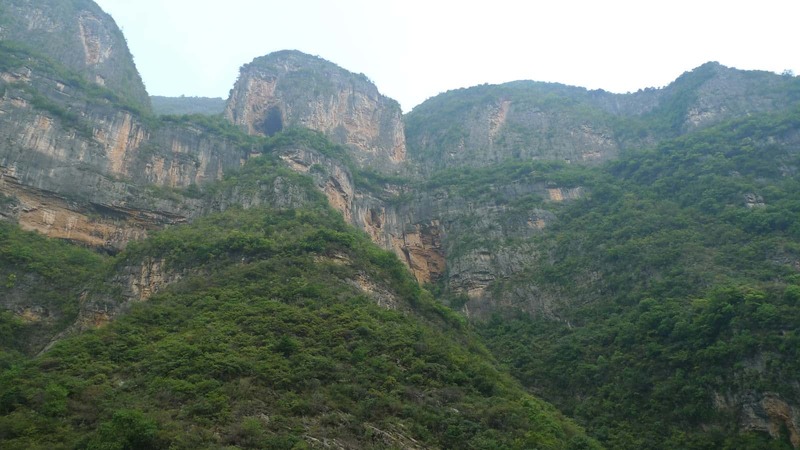 There are many caves built into the mountains, and we were told that they have been used by local tribes over the centuries to hide from invading enemies. I have no idea how they got into that cave. 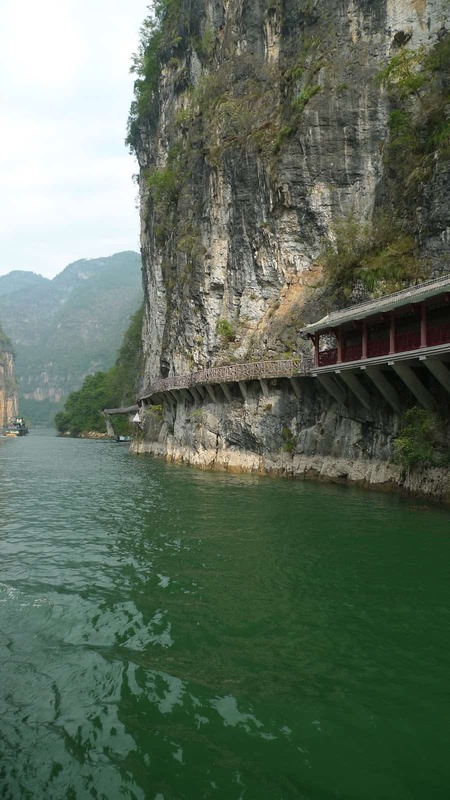 This incredible structure is called the 3 Gorges Ancient Plank Road parts of which can be traced back to 300BC. 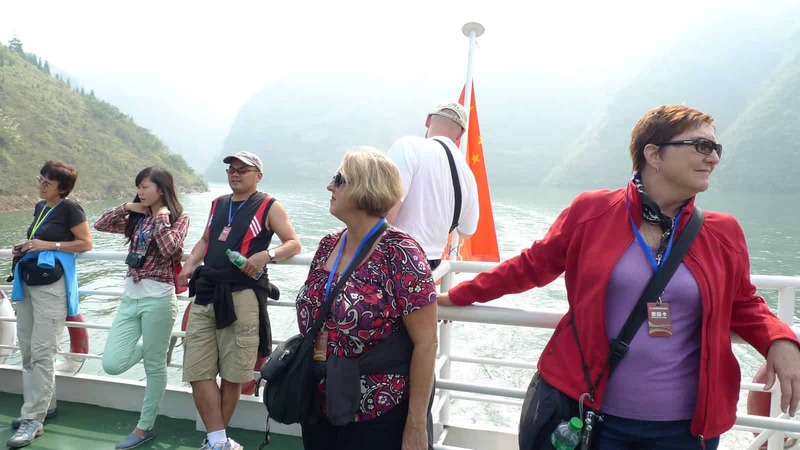 For centuries it has served the needs of the local people because the dangerous rapids and currents of the Yangtze River along the Three Gorges section made transportation really hard work, especially in flood seasons when all shipping along the river closed. 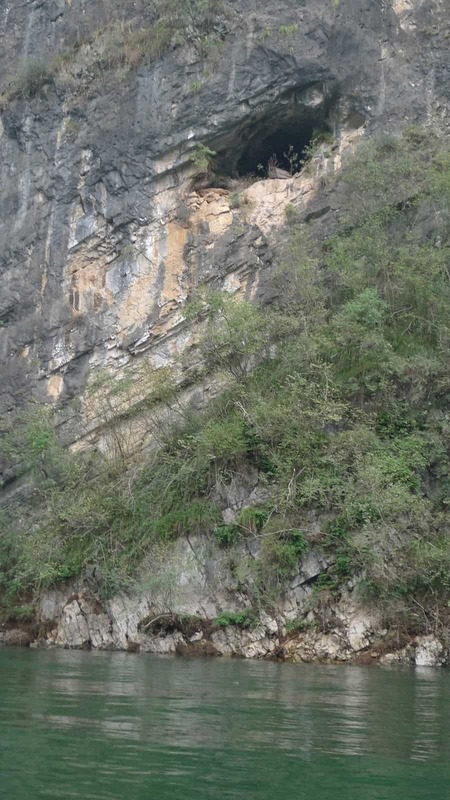 The local Shu People began drilling holes in cliffs to beat in stakes in order to support the planks, or they chiseled a road directly into the cliffs. These are the two forms of plank roads. 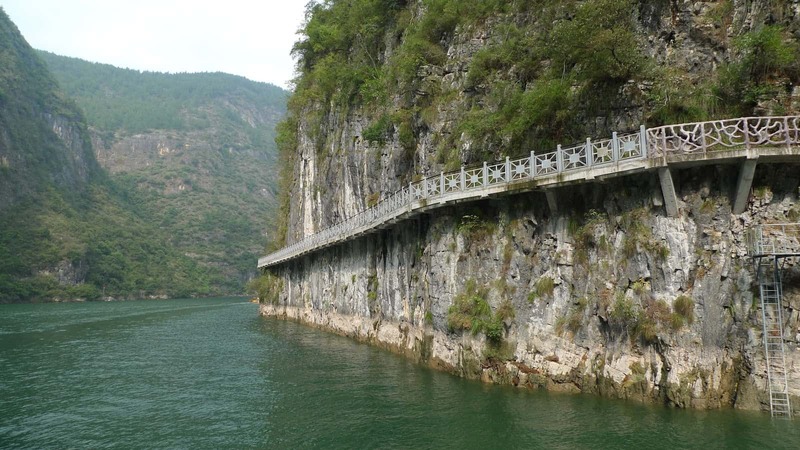 With iron chain railings or stone balustrades along the sides of the roads, they were safe for people to walk on. I didn’t see any people walking on them, but they looked pretty well maintained so I suppose they are safe. It was a really interesting path, with several stopping points along the way, like pagodas, I guess for taking in the view. Now, there was some talk about the Americans helping with the restoration of these plank roads, but it seems I wasn’t paying attention. Dave knows about it, so if you’re interested, just ask him..
Notice how beautiful and green the river is. There is Jimmy, George, Marilyn, Kay & Stan. 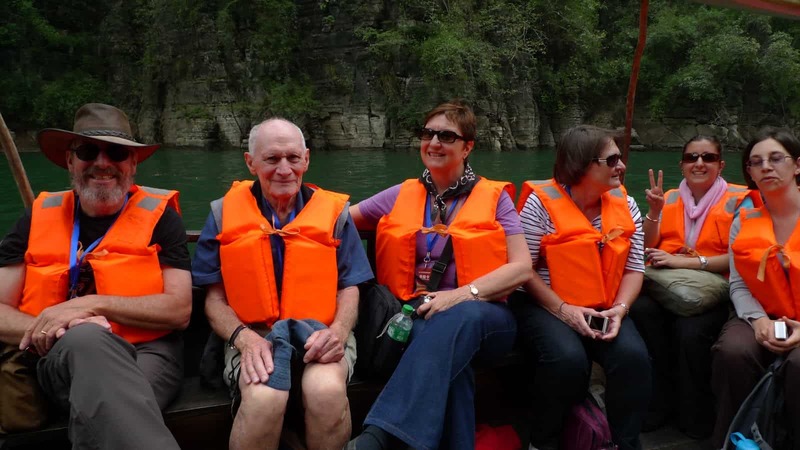 So here we all are on our traditional sampan. Luckily the weather was great so we were able to see everything clearly. And here is Dave, Sam, Sue, Margaret, Anne & Helen. All looking pretty impressed. We were surprised by the contrast in the color of the water. 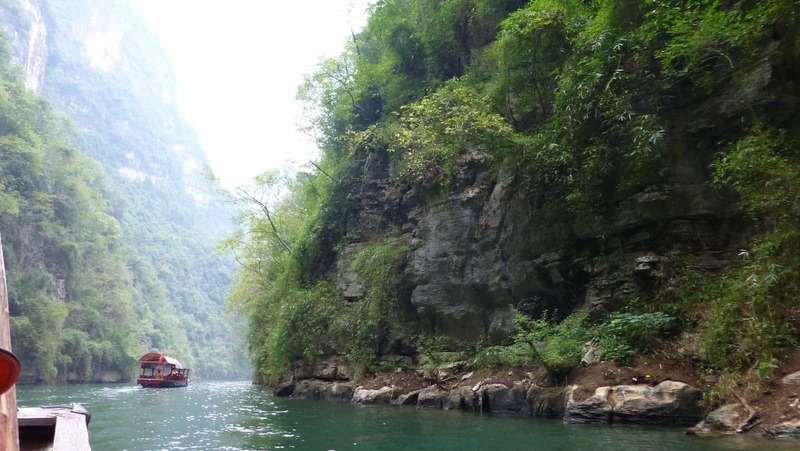 Beautiful emerald green water flowing, much different from the Yangtze’s dark brown that we had become accustomed to. 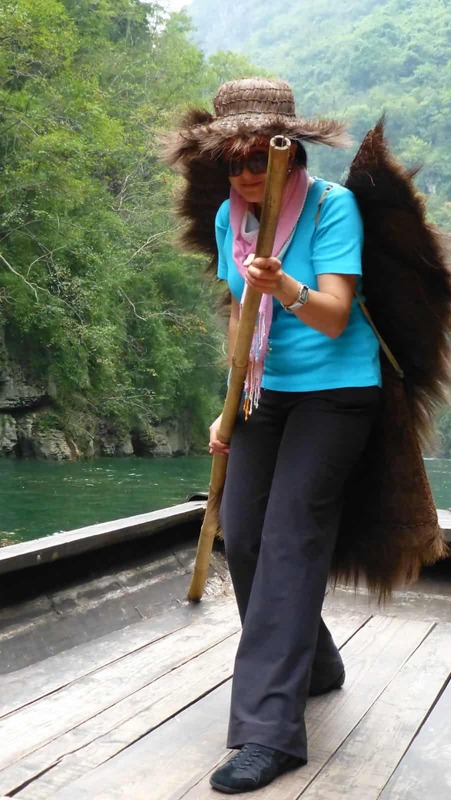 The people who live around here are part of an ethnic minority group, and our local guide provided great commentary during the sampan trip. He was pretty funny really, and gave Stan and Anne an opportunity to don his traditional “raincoat”. Nobody else was game to give it a go, so well done you 2 for getting into the spirit! How pretty is this! At every turn there was another magnificent sight. 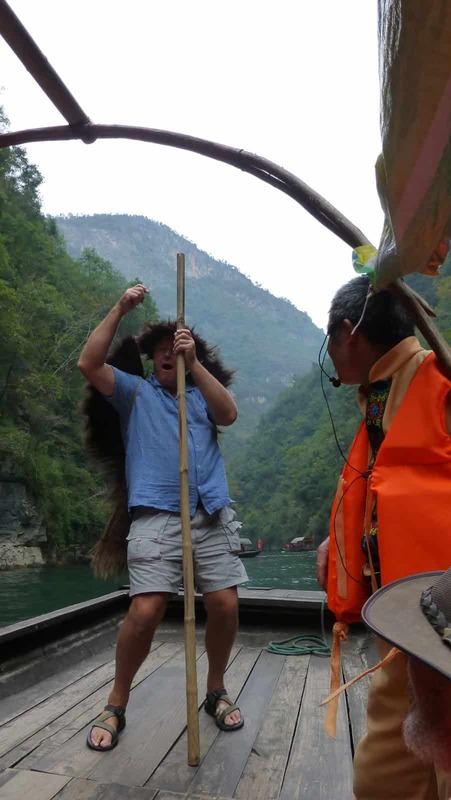 At various vantage points we came across local people standing in boats or on little cliff ledges singing traditional Chinese tribal songs. Quite strange really. Apparently they’re paid by the Tourism Board to entertain we tourists. I’m not convinced they’re enjoying themselves. Have a look at this video. Returning on the ferry boat back to our cruise ship, we came upon the most bizarre sight. Check out this video. 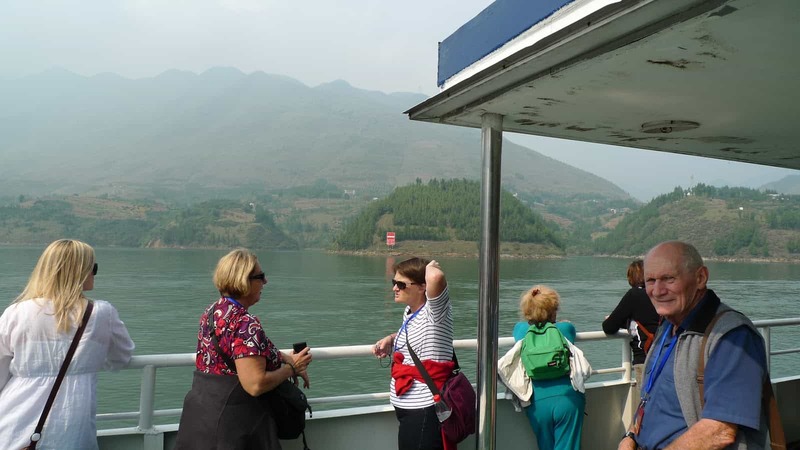 There’s a heap of Chinese people swimming back and forth across the Yangtze! They were everywhere, and there were other ferries cruising along at a reasonable speed. These swimmers just moved around the boats and were really enjoying themselves. Curious. It looked like some sort of organised swimming group. 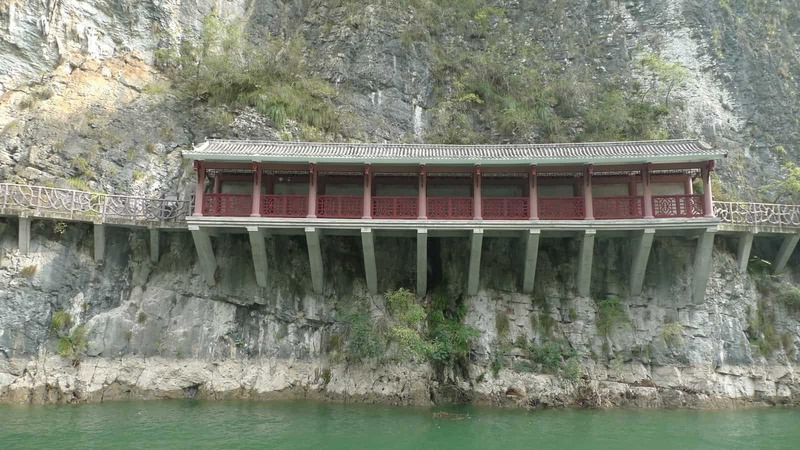 On either side of the river were concrete steps and little pavilions where the people congregated. By the way, the big signs along the shore say something about keeping the river clean and protesting against air pollution. 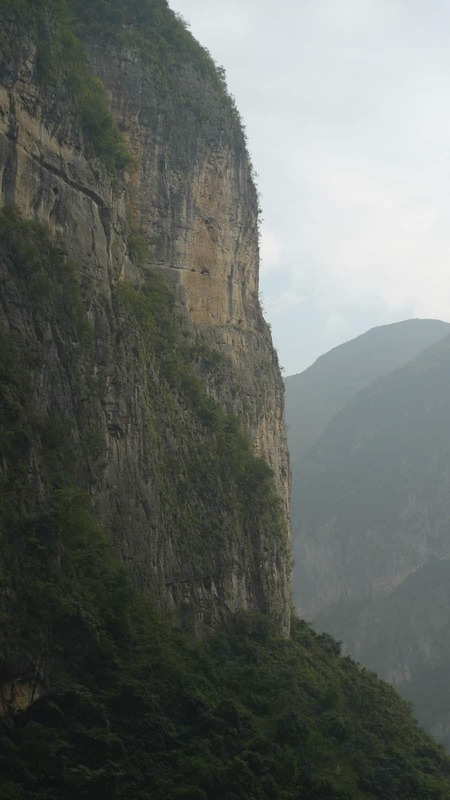 There’s a strong environmental lobby in China it seems. We really had the best day out and I’ll always remember this excursion as a stand out. 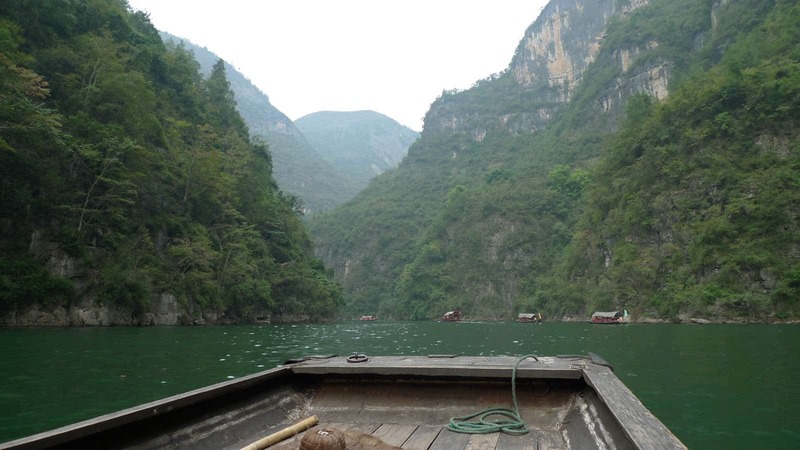 I’m amazed yet again at the beauty of countryside China. 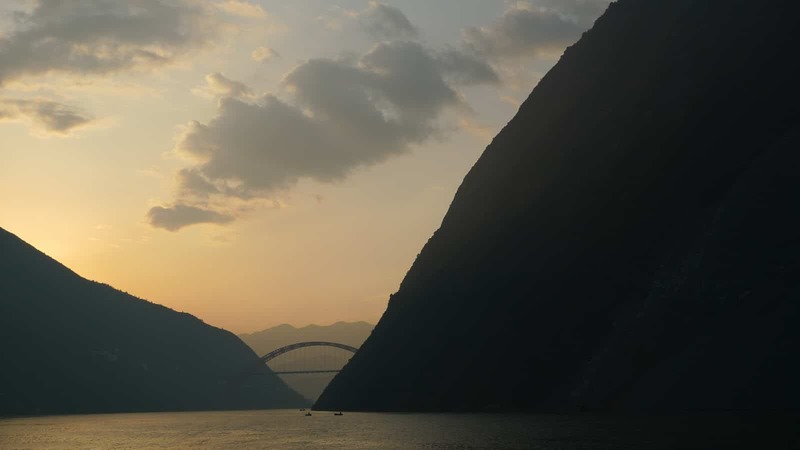 Now, it’s going to be a big night tonight as we get to see the greatly anticipated (by Dave & Sam) 3 Gorges Dam site and the massive dam locks. For anyone interested (mostly the blokes) they could be up on deck around midnight when our boat was scheduled to go through the locks. Dave and I were very fortunate back in 2006 to take a canal boat through canals in northern Wales and the Pontcysyllte Aqueduct, and we managed to get ourselves through their lock systems with no trouble and so Dave was very keen to check out these huge structures and to be a part of the transition. 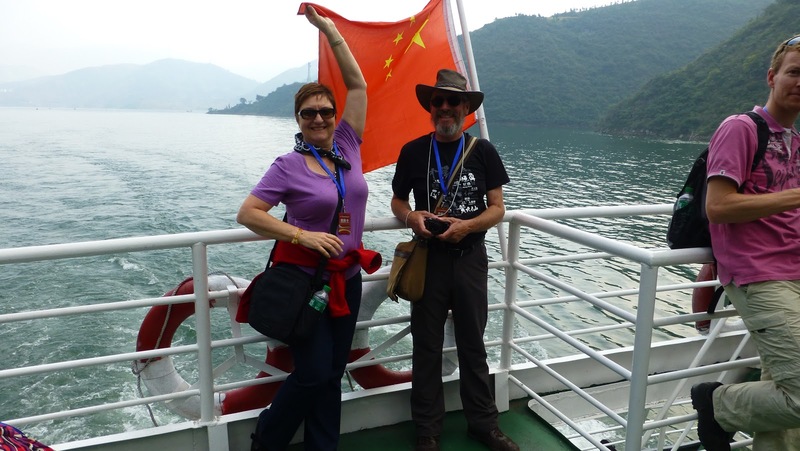 Please come back soon so I can tell you all about the 3 Gorges Dam lock crossing and the dam visit.